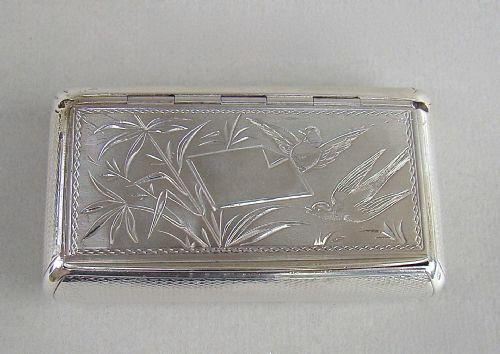 This good quality Mid-Victorian silver snuff box is dated Birmingham 1866. Of oblong form, with scalloped edge, the hinged cover with engine-turned and foliate decorations surrounding a vacant cartouche. The hinged cover with raised thumb piece. The sides and back with conforming decorations. Date letter "R" for 1866. The hinge is very strong. 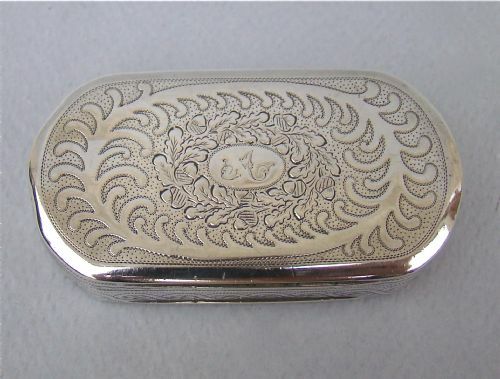 This stunning George III curved silver snuff box was made in Edinburgh between 1806 and 1811 by P. Cunningham. It is exquisitely executed. The flush hinged cover bright-engraved with acorns and scrolls and centered by an initialled medallion, the back engraved with conforming decorations. The sides engraved with a wriggle-work and prick-dot border. Gilt interior engraved with a latin message. The front is in very good condition. The back is in good condition. Interior gilding in good condition. 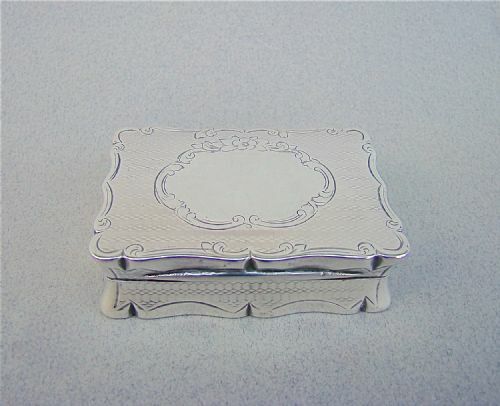 This is a wonderful solid silver table snuff box made by Samuel Pemberton, one of the most renowned Birmingham toy maker*. The hinged cover bright-engraved with an acorn garland within a seaweed pattern garland. 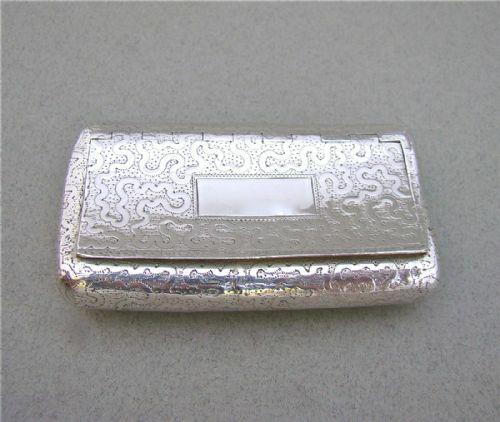 It is centered by an engraved oval reserve, the back finely engraved with matching patterns. The sides engraved with a rope garland within prick-dots borders. * from the late 18th to early 19th Century, Birmingham was the centre for the making of “toys”: small decorative objects from silver. They were produced in small family businesses and factories throughout Birmingham. They made a range of items including patch boxes, nutmeg graters, buckles, caddy spoons, vinaigrettes, snuff boxes and babies rattles. The front is in perfect condition. The back is in perfect condition. Interior gilding in super condition. 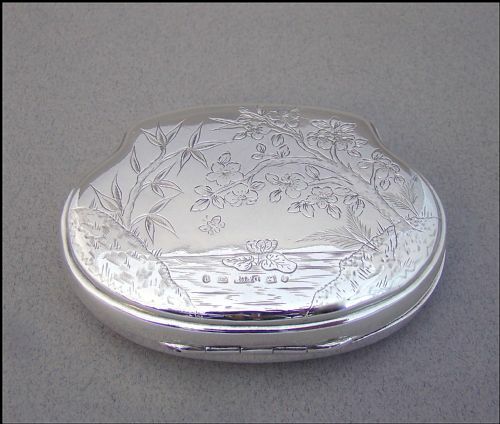 This delightful George III curved silver snuff box was made in Birmingham 1812 by the renowned Joseph Taylor. It is small but exquisitely executed. The flush hinged cover bright-engraved with seaweed patterns and centered by a vacant oval reserve, the back engraved with a flowerhead within prick-dot borders. The front is in very good condition with just a pin prick on oval reserve. condition. 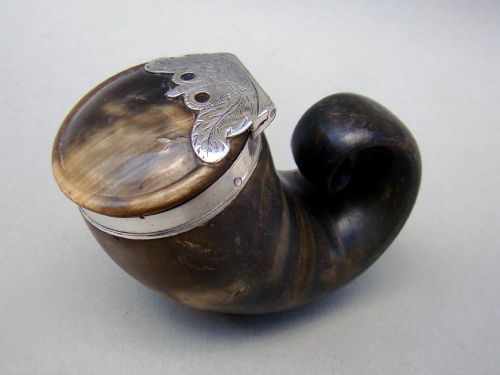 This is a wonderful snuff mull* with a decorative silver mount. 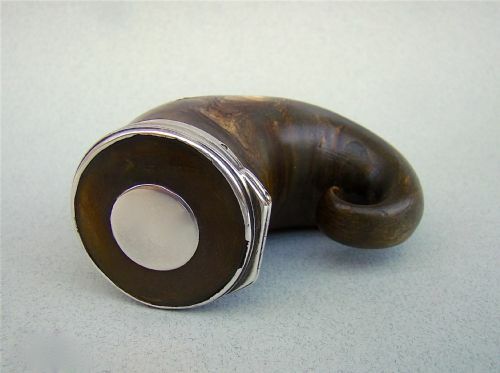 The ram's horn body with a plain unmarked silver neck. The hinged lid decorated with silver shells and scrolls and applied with a vacant silver plaque. The lid with inner cork. *Snuff mull comes from a Scottish dialect word for "mill", where the snuff would have been ground to a powder, mulls came in a variety of shapes, the most common being fashioned from a ram's horn. Unmarked as it was very often the case with snuff mulls but tested and guaranteed silver. Length: 9cm / 3.4 inches. Body in excellent shiny condition. Silver hinge and decorations in excellent condition. Minor hairline crack to the lid, commensurate with age. 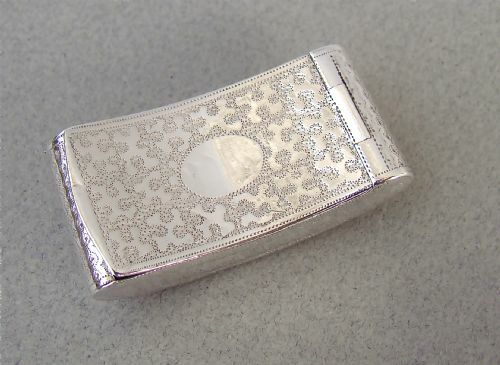 This wonderful Victorian silver snuff box is dated Birmingham 1881 and is typical of the Aesthetic movement period. Shaped like a purse, the front engraved with a butterfly flying over a pond, surrounded by bamboos and flowering prunus, a water lily and grassy banks . The back engraved with flowering prunus. D&LS for David & Lionel Spiers. Date letter "g" for 1881. This is a wonderful early snuff mull* with a plain silver mount. The ram's horn body with an unmarked silver neck. The hinged lid applied with a vacant silver roundel. Length: 8cm / 3 inches. Lid diameter: 3.5cm / 1.2 inches. Silver hinge and neck in very good condition. Tiny loss of silver ton back of rim. 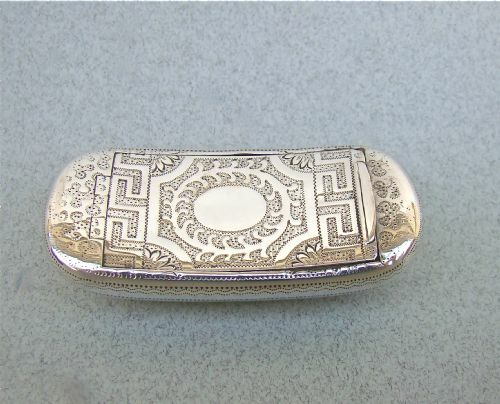 This wonderful 19th C French silver snuff box dates circa 1870 and is typical of the Aesthetic movement period. The front engraved with flying swallows amongst bamboos and surrounding a vacant reserve, the back and sides with engine-turned decorations. 19th C. French maker's mark in lozenge punch mark. 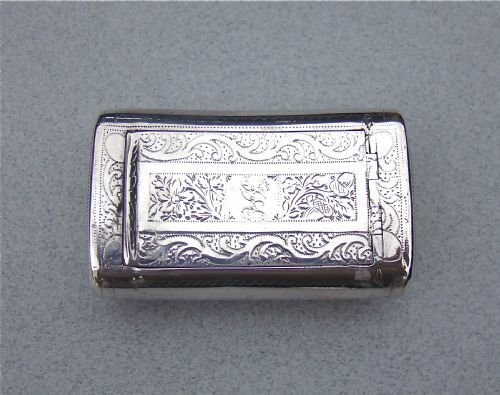 This delightful George III curved silver snuff box was made in Birmingham 1824 by the renowned toy maker* Ledsam & Vale. It is a good size and exquisitely executed. The flush hinged cover bright-engraved with seaweed patterns and centered by a vacant rectangular reserve, the back and sides engraved with conforming decorations. L&Co for Ledsam & Vale. The front is in very good condition . The back is in good condition with minor unevenness. Interior gilding pale but in clean condition. This delightful George III curved silver snuff box was made in Birmingham 1807 by the renowned toy maker Joseph Willmore. It is exquisitely executed. The flush hinged cover bright-engraved with seaweed and key patterns and centered by a vacant oval reserve, the back engraved with a flower garland within prick-dot borders. Date letter "j" for 1807. A little hard to open. The front is in excellent condition. The back is in equally good condition. Interior gilding in good condition, with a little rubbing at places. This is a wonderful snuff mull* with a decorative silver mount. 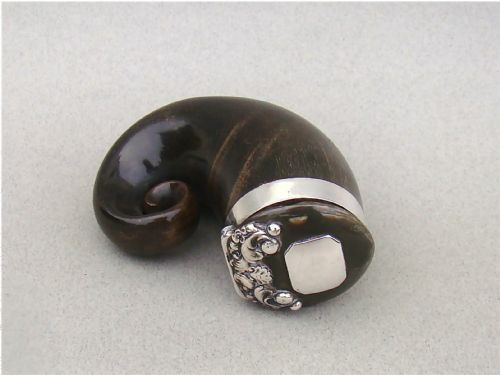 The ram's horn body with a plain unmarked silver neck. The hinged lid decorated with an engraved silver coronet framed by a pair of feathers. Length: 8.5cm / 3 inches. Lid diameter: 4cm / 1.4 inches. This is a rare and exquisite Georgian silver patch box, of circular form with stippled and punched borders. It bears the marks of the prolific silversmith John Taylor, who specialised in small pieces and objects of vertu. 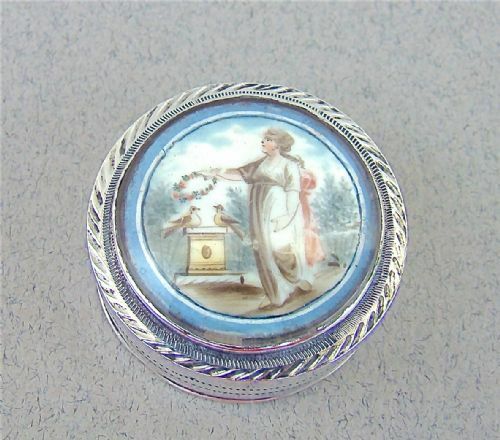 The pull off lid with a glazed panel over a painted scene depicting a lady holding a floral garland and standing by two birds perched on a memorial. Marked only to base with maker's mark 'IT' for Joseph Taylor. Excellent. No dings, no dents. Diameter: 2.7cm / 1 inch. Georgian patch boxes are few and far between, not as readily found as vinaigrettes or snuff boxes,this is a delightful and very rare example. Postage overseas: from £10 International Signed For.